Primary comparative texts of Rabbinic Wisdom, including "greatest commandment" parallels, from Mahlon H. Smith's Into His Own: Perspective on the World of Jesus, Rutgers University. XXXIV.25-28, 30, 32-34, 45; Tatian's Diatessaron (c. 150-160). I.6, Against the Heathen, Athanasius of Alexandria, c. 318. "Sacrifices and outward worship never pleased God unless we first did the things which we owe to God and our neighbours." "Those who sincerely desire to be taught their duty, Christ will guide in judgment, and teach his way." "Which is the first commandment? - The principal, and most necessary to be observed." The Unity of the Divine Being (Mark 12:32). Sermon by John Wesley. "The First and Great Commandment," Mark 12:30, Charles H. Spurgeon, 1857. "This was a question which, with some others, divided the Jewish teachers into rival schools. Our Lord's answer is in a strain of respect very different from what He showed to cavillers--ever observing His own direction, "Give not that which is holy to the dogs, neither cast ye your pearls before swine; lest they trample them under their feet, and turn again and rend you""
"Pharisaism consisted of forms and paid little attention to love, mercy, and purity of heart." Commentary, Mark 12:38-44, Emerson Powry, Preaching This Week, WorkingPreacher.org, 2015. "Nothing in Mark's story prepared the reader for this conversation between Jesus and this Jerusalem scribe." "Open Source," Nancy Rockwell, The Bite in the Apple, 2015. "The Great Lover," David F. Sellery, This Week's Focus, 2015. "It is curious to see that both the Scribe and Jesus seem to feel entitled to have the last word, commending the other. There is unusual accord in their views of the law." "Not Far," Nancy Rockwell, Bite in the Apple, 2012. "The debates and the campaign have focused on such questions about taxes - whether involving other nations and their money in our personal taxes and in our national tax situation is kosher or not – and whether women have to bow to serving the will of others, or are free to make their own decisions about their lives and how they use them." Question of Which Commandment Is the Greatest, audio telling, story in episodes, graphic, audio and written commentaries. Go Tell Communications, Biblical Storytelling for the Global Village, 2012. Commentary, Mark 12:38-44, Henry Langknecht, Preaching This Week, WorkingPreacher.org, 2009. "This reading from the Gospel of Mark is a two-act drama with some intriguing and troubling connections." Holy Textures, Understanding the Bible in its own time and in ours, Mark 12:28-34, David Ewart, 2012. "No one in that crowd of both opponents and admirers would dispute, "Love of God," as the greatest commandment. But when Jesus goes on and links it to, "Love of neighbour as oneself," he has lifted attachment to the welfare of one's neighbours above all other duties and obligations, including - gasp! - religious ones." "Perfect Obedience," Alan Brehm, The Waking Dreamer, 2009. "God’s original intention for humanity in the first place was to live in relationship with God, loving and serving God by loving and serving others. It is a life of obedience that creates justice, and freedom, and peace for us all." "Which Is the Greatest Commandment?" Michael A. Turton's Historical Commentary on the Gospel of Mark, "a complete verse-by-verse commentary on the Gospel of Mark, focusing on the historicity of people, places, events, and sayings in the world of the Gospel of Mark." "First Thoughts on Year B Gospel Passages in the Lectionary," Pentecost 23, William Loader, Murdoch University, Uniting Church in Australia. "Many people are closer to the kingdom of God out there in the world than those inside the church because they have grasped at least some of the perspective present in this anecdote." "Our sainthood isn't about what we do or try to do. It's about the God -- the one holy God -- who touches our lives." Holy Textures, Understanding the Bible in its own time and in ours, Mark 12:28-34, David Ewart, 2009. "Who knew that at the peak of confrontation between Jesus and the religious elites of Jerusalem, it would be one of them who would embody Jesus' proclamation of God's Good News?" "The Hinge, The Two Great Commandments," Gospel Analysis, Sermons from Seattle, Pastor Edward F. Markquart, Grace Lutheran Church, Seattle, Washington. Detailed background and exegesis. "Love Yourself So That You Can Love Your Neighbor," Ordinary 31B, Fr. Gerry Pierse, C.Ss.R., from Sundays Into Silence: Reflections on the Sunday Gospels in the Light of Christian Meditation. Claretian Publications.
" I believe that the great obstacle to love of others lies in the fact that we have been taught not to be at home with ourselves." "What's Most Important?" Larry Broding's Word-Sunday.Com: A Catholic Resource for This Sunday's Gospel. Adult Study, Children's Story, Family Activity, Support Materials. "What is the highest value of our culture? How does that single value arrange other values?" Wellspring of the Gospel, Ordinary 31B, Catherine McElhinney and Kathryn Turner, Weekly Wellsprings. "The Paramount Issues of Life: Mark 12:28-31," J. Hampton Keathley III, Biblical Studies Foundation. "Love for others can only grow out of the soil of love for God as it is fed and watered by fellowship with God in the streams of the Word (cf. Ps. 1:2)." "Ethics: Ministry of Jesus," "Mark 12: The Greatest Commandment," "Mark 12: Teaching the Crowd," wikipedia. "Jesus, Apocalyptic, and World Transformation," David B. Batstone. Theology Today, 1993. "It is often overlooked how ideologically explosive the notion of the kingdom of God was within Jesus' own social milieu. In first-century Palestine, it did not have the same metaphorical and strictly religious connotation that makes the term so safe within our own theological world. In fact, it evoked the memory and visionary impulse of Yahweh who acts to deliver Yahweh's 'chosen ones' from occupation and oppression at the hands of alien nations. Intrinsic to that symbolic universe is the conviction that the chosen suffer and the unjust prosper in the present day only because history stands at the brink of a great reversal." DePuy, Norman R., "The Simple Profundity," The Christian Century, 1991. Edelman, Marian Wright, "A Parent, Community, and National Audit: Who Are Our Children Modeling?" The Living Pulpit, 2003. Gomes, Peter J., "All Sinners, All Saints," The Christian Century, 1997. Heil, John Paul, "The Narrative Strategy and Pragmatics of the Temple Theme in Mark," The Catholic Biblical Quarterly, 1997. Hoyer, George W., "Mark 12:28-34, Expository Article," Interpretation, 1979. Meyers, Robin R., "Extra Credit," The Christian Century, 2000. Norfleet, Agnes W., "Between Text and Sermon: Mark 12:28-34," Interpretation, 1997. Palmer, Maria Teresa, "Another Commandment," The Christian Century, 2006. Parsons, Howard L., "The Commitments of Jesus and Marx: Resources for the Challenge and Necessity of Cooperation," Journal of Ecumenical Studies, 1985. Verbin, John S. Kloppenborg, "Egyptian Viticultural Practices and the Citation of Isaiah 5:1-7 in Mark 12:1-9," Novum Testamentum, 2002. Wesselschmidt, Quentin F., "19th Sunday after Pentecost," Concordia Journal, 1985. "The Hinge," Sermons from Seattle, Pastor Edward F. Markquart, Grace Lutheran Church, Seattle, Washington. "Kingdom Built by Love," the Rev. Gemechis Desta Buba, Day 1, 2003. "The Most Important Part," and "The Greatest Commandment," Charles Kirkpatrick, Sermons4kids.com. "All Else Fails," Rev. Dr. Edgar Mayer, Lutheran Church of Australia. "The Great Commandment," children's study, puzzles, coloring sheet, etc. Higher Praise Christian Center. "Can't Touch This," Fred Lane, dramatix. "Neighbours from Hell," Erina Caradus, dramatix. 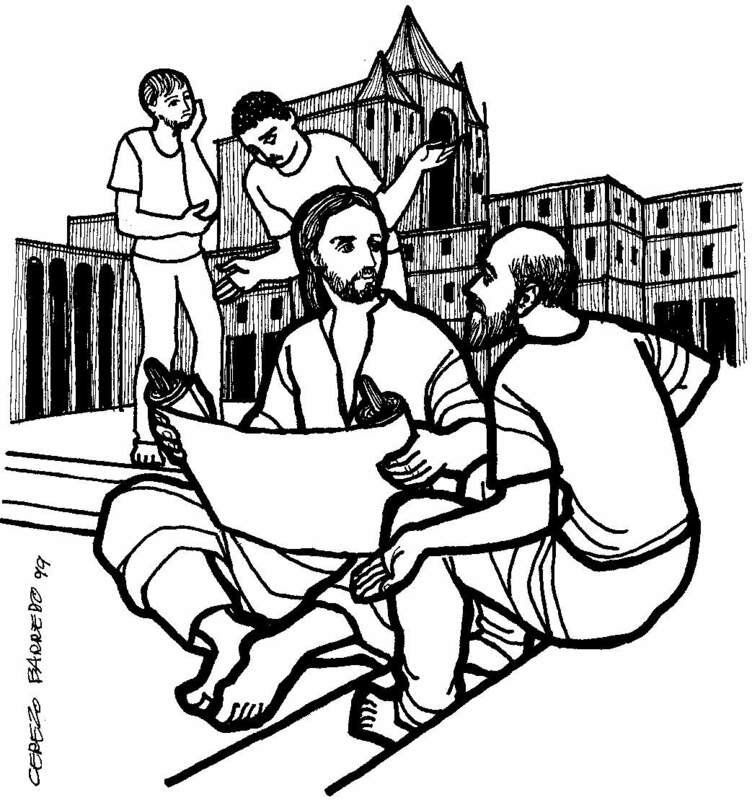 Mark 12:28-34 at Cerezo Barredo's weekly gospel illustration. Liberation emphasis. Commercial Site: "Love Your Neighbor," (Mark 12) Visual Liturgy/Film, The Work of the People.